THE B-MOVIE NEWS VAULT: Scream Factory now offering up a trio of John Carpenter classics in Limited Edition Steelbooks! Scream Factory now offering up a trio of John Carpenter classics in Limited Edition Steelbooks! FANS OF STEELBOOKS REJOICE! 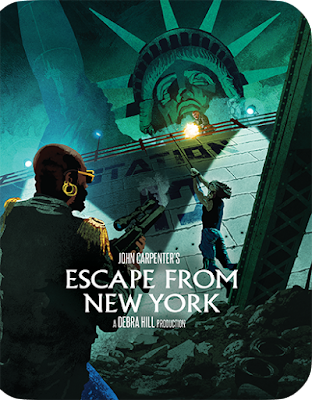 SCREAM FACTORY'S NEW LIMITED EDITION RELEASES OF "ESCAPE FROM NEW YORK," "THE FOG," AND "THEY LIVE" ARE JUST FOR YOU! I've never been big on collecting steelbook releases (I've double-dipped enough thank you), but sometimes I will splurge on one if it looks appealing enough to me. That being said, had I not already owned these Scream Factory titles, I would be all over the new Steelbooks! Aside from fancy new artwork, all the extras and transfers are exactly the same as before. This is strictly something for the steelbook crowd! Everyone else, just move along and stop grumbling about it, especially since Scream Factory dropped several other new titles today as well! Synopsis: A thrilling landmark film that jolts along at a breakneck pace, ESCAPE FROM NEW YORK leapt to cult status with high-octane action, edge-of-your-seat suspense and the mind-blowing vision of lone warrior Snake Plissken (Kurt Russell) battling his way out of a post-apocalyptic Manhattan! 2K Scan Of The Interpositive, Struck From The Original Negative! Audio Commentary With Actress Adrienne Barbeau And Director Of Photography Dean Cundey! 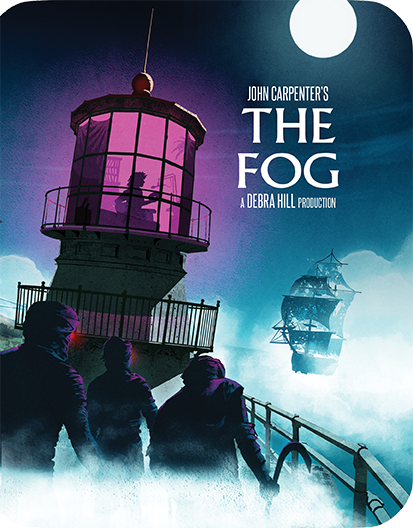 Audio Commentary With Director John Carpenter And Actor Kurt Russell! Audio Commentary With Producer Debra Hill And Production Designer Joe Alves! On Set With John Carpenter: The Images Of ESCAPE FROM NEW YORK With Photographer Kim Gottlieb-Walker. I Am Taylor: An Interview With Actor Joe Unger. My Night On The Set: An Interview With Filmmaker David DeCoteau. ORDER IT NOW AT AMAZON, BULLMOOSE, DIABOLIK DVD, OR SHOUT! FACTORY. 1080p High-Definition Transfer Supervised By Cinematographer Dean Cundey! Audio Commentary With Writer/Director John Carpenter And Writer/Producer Debra Hill. Audio Commentary With Actors Adrienne Barbeau, Tom Atkins, And Production Designer Tommy Lee Wallace. Interview With Jamie Lee Curtis. Synopsis: They influence our decisions without us knowing it. They numb our senses without us feeling it. They control our lives without us realizing it. THEY LIVE. Audio Commentary With Writer/Director John Carpenter And Actor Roddy Piper. Independent Thoughts – An Interview With Writer/Director John Carpenter. Man Vs. Aliens – An Interview With Actor Keith David. Woman Of Mystery– An Interview With Actress Meg Foster. 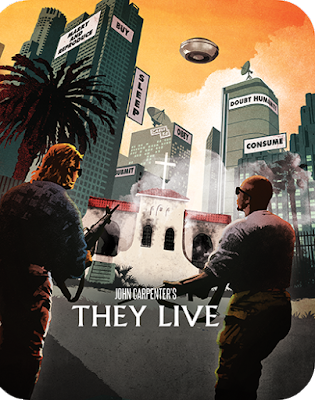 Watch, Look, Listen: The Sights & Sounds Of They Live – A look At The Visual Style, Stunts And Music With Director Of Photography Gary B. Kibbe, Stunt Coordinator Jeff Imada, and Co-Composer Alan Howarth.